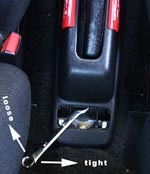 Just wanted to share with you all how easy it is to adjust the parking brake on CRX-ses. There is a small nut that is right under the pb lever console trim. It takes about 2 minutes to make your parking brakes adjusted properly. To give you an idea how tight it should be - parking brake should hold your car on the 10% hill on between 6 and 10 clicks of the parking brake. 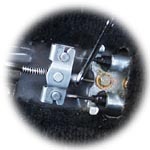 You can do adjustments with lever console removed or in-place. It always helps to remove small panels once in a while and clean them separately as well as surface under those panells.